Now available, a monophase 200 V electric drill. Only from RAILMAN. In recent years, makers of electric equipment have stopped producing 200V specs. 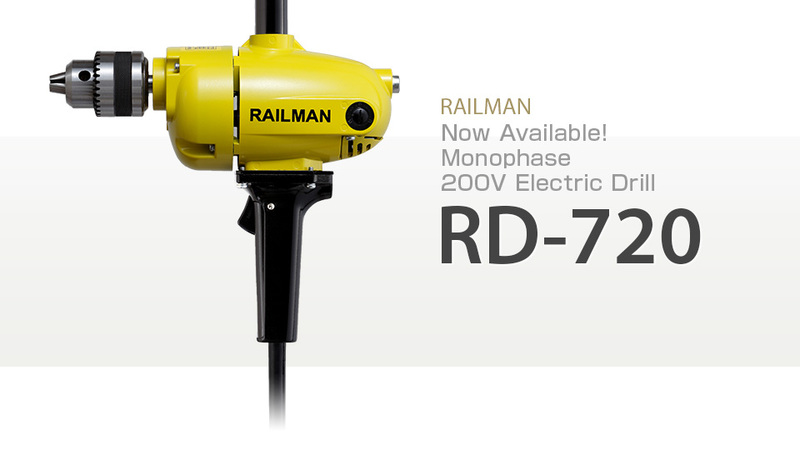 The 200V electric drill was one of RAILMAN's first products. Now we are proud to announce our first 200V drill in 78 years. RAILMAN talked to users and discovered that 100V lacked the power they needed. Our new drill has more power and shorter punching time. RAILMAN drills come with tapering drill chucks as standard equipment for precise punching. The tapered chuck means less vibration at the core for stable and comfortable operations. RAILMAN's drill uses a precision A-grade chuck for machining tools. Take this opportunity to try out a tapering drill chuck! RAILMAN aimed to make a drill with excellent operability. The cable is connected to the edge of the handle on the switch side for smooth maneuvering. Cable won't get twisted around the handle. Lightweight tools are preferred for railroad maintenance. RAILMAN drills have aluminum die cast bodies to keep thickness of appearance parts to a minimum. As the cable is pulled from the handle side, it won't get tangled up, ensuring safe operations. As a motor manufacturer, RAILMAN products have specs that can be used anywhere in Japan, both 50 Hz and 60Hz areas, and connected to most power generators. RAILMAN specs make equipment easy and convenient to operate. Standard RAILMAN cables are 10 m long. 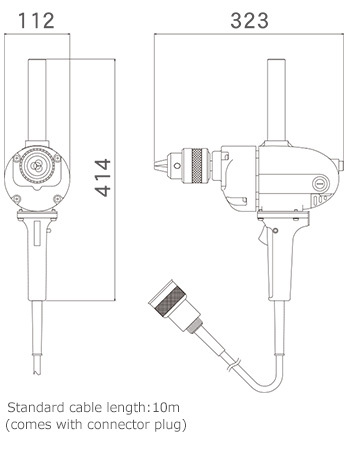 The electric blower also comes equipped with a connector plug to connect to the RAILMAN Tie Tamper. RAILMAN, for safe, comfortable railroad maintenance.